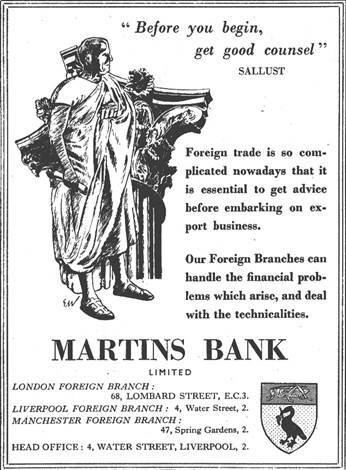 The drawings commissioned by Martins for use in advertising in the 1940s prove to be very popular, and regular monthly and seasonal advertisement slots in a number of publications continue to feature these outstanding artworks over many years. 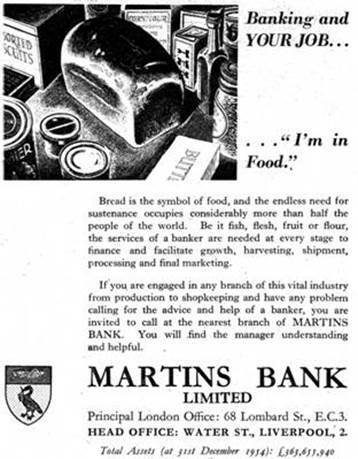 The archive has a large number of 1950s advertisements which will be laid out below in order of year of publication. 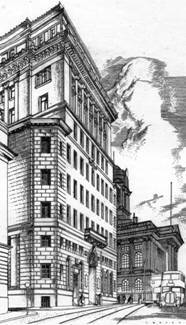 They begin with more commissioned artworks, and this time the bank uses the services of several different artists. 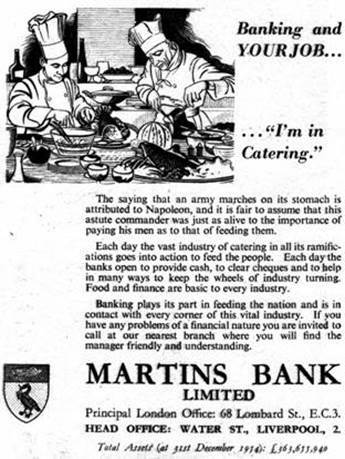 We have seven examples from 1950 of drawings commissioned by Martins for use in its advertising. 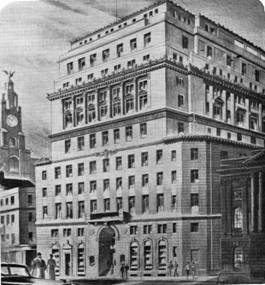 This includes three different impressions of Head Office Building at 4 Water Street Liverpool. 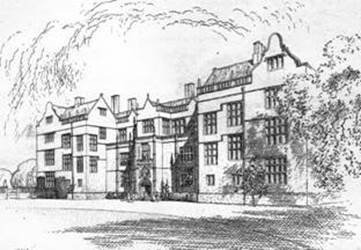 For our 1951 series of advertisements we have chosen the theme of England's stately homes. In many ways they epitomise all that is best in our English way of life:—breeding, tradition, dignity and service to the community, and so they form a suitable medium of linking up our own message to the public. 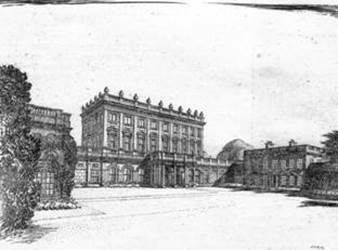 The set lends itself to pictorial illustration of high quality and the idea has the advantage of topicality following the publication last year of the report of the Commission appointed to investigate the problems facing the owners of these places as regards maintenance and preservation. 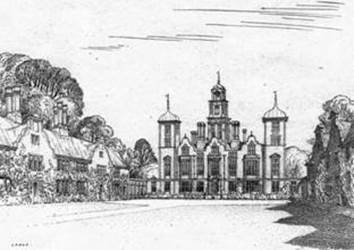 Three artists were chosen to execute the drawings, G. H. Wedgwood, J. C. Armitage and F. G. Lodge. Our readers are already familiar with the work of Geoffrey Wedgwood and Josh Armitage (‘Ionicus’). 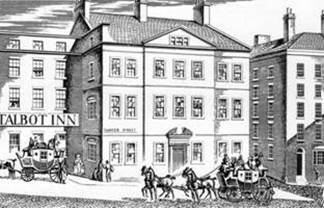 F. Graham Lodge, however, is a newcomer to bank advertising. 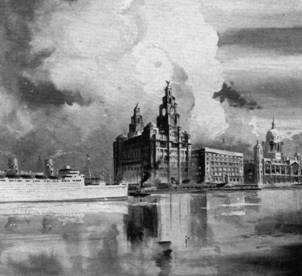 He is a black and white artist and his work has appeared in a large number of publications, including the Radio Times. He was artist to ‘Everyman’ from 1929 to 1931 and to the " Observer " from 1929 to 1934. 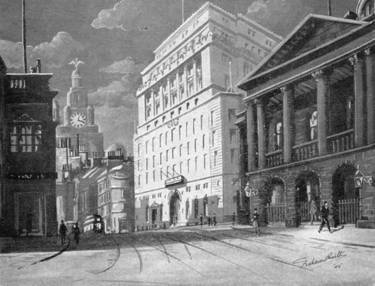 Samples of his work have been acquired by the Belfast Art Gallery, the Bank of Scotland, the Athenaeum Club, H.R.H. the Princess Royal, Colonel Lord Wigram and others. He has exhibited at the Royal Academy. Born in 1908, he was educated at King's School, Grantham and University College, London, also at London University. He served throughout the second World War, being invalided out of the Forces in 1945 and has since taught in London schools. His hobby is gardening. 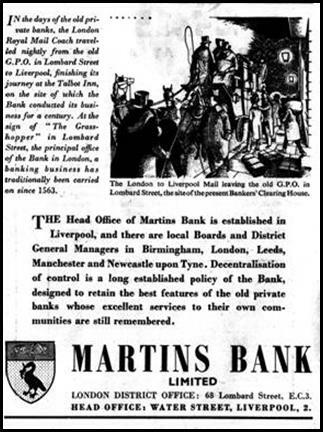 The decline of the old private or ‘country’ banker and the growth of joint stock banking was part of the process of modernisation of life in these islands, modernisation in which the improvement of communications played a very large part. 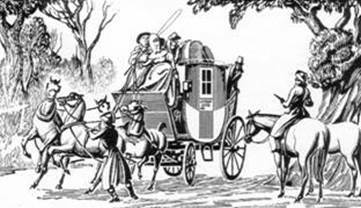 The stage coach era has always been considered romantic and picturesque, thanks partly to Charles Dickens and in more recent times to Baroness Orczy. Picturesque it certainly was, but we cannot concede the romance. 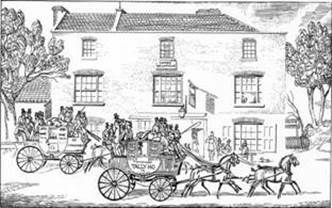 To travel in or on a stage coach was a most unpleasant experience and a test of endurance which was only undertaken of necessity. 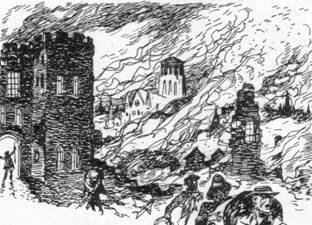 There was the ever-present danger of footpads and highwaymen, overturning due to bad roads, breakdowns and indifferent inns. There is even one incident on record of the horses drawing the Exeter Mail being attacked by a lioness which had escaped from a nearby menagerie. 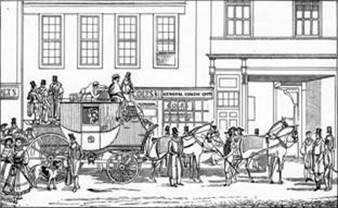 Stage coaches are said to have begun about 1640 and the very last coaches were probably those in use in Lakeland as late as 1914. 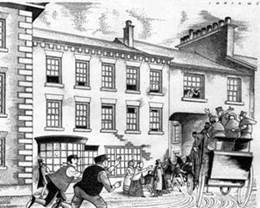 As regards crime on the roads, the year 1893 seems to have been remarkable for a spate of road robberies and in that year the Bristol Mail was robbed of a bank parcel valued at upwards of £1,000. 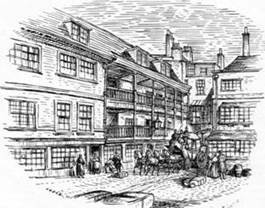 In 1822 the Ipswich Mail was robbed of notes to the value of nearly £32,000. No more eloquent comment on the state of the roads can be found than is contained in Blew's book " Brighton and its Coaches." 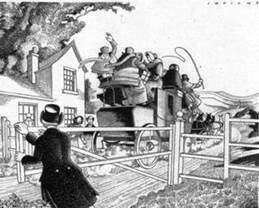 He says:—" The Sussex roads seem to have gained an unenviable notoriety for badness from a very early period. 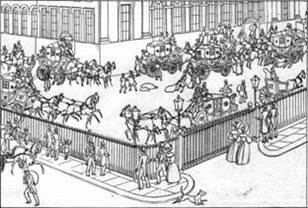 When the Emperor Charles VI came to England to visit the Duke of Somerset in 1703, his coach capsized a dozen times before he reached Petworth." 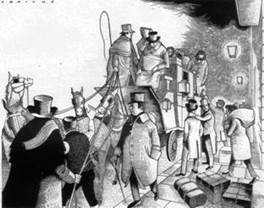 If the roads treated the coach of an Emperor like that, what hope was there for the ordinary traveller? 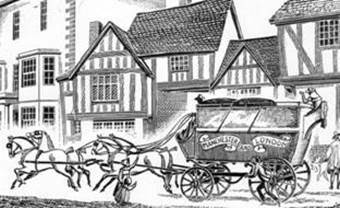 Because of the connection with the rise of banking as we know it today the Stage Coach period has been chosen as the theme for this year's series of advertisements. 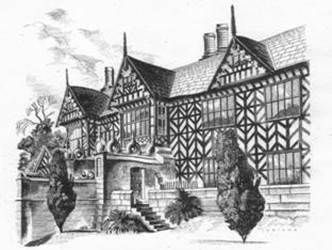 Seven of the drawings have been done by our old friend Geoffrey H. Wedgwood, four by the inimitable Ionicus (J. C. Armitage) and one by F. Graham Lodge. The careers of each of these artists have been outlined in previous issues of the Magazine. 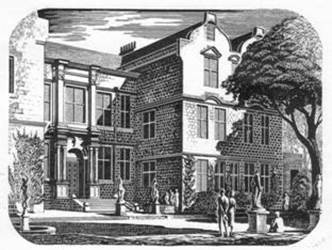 Two or three of the Wedgwood drawings are the artist's simplification of well-known colour prints of stage coaches, a simplification which was essential because of the exigencies of reproducing the drawings on a very small scale. It has been left to Ionicus to give the touch of humour which adds so much to the attraction of the drawings and to the appeal of the series. 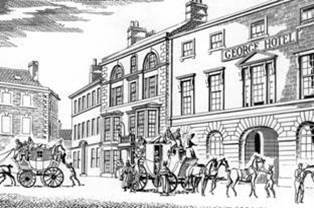 Although many of the old coaching inns are picturesque as to their interiors the artists found that some of the subjects we had to choose were not, of them­selves particularly attractive and one or two of the inns were not now in existence. 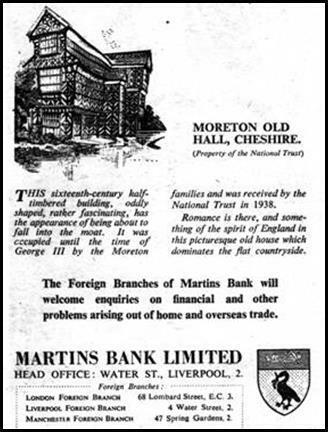 It was a matter of satisfaction that we were able to find a positive connection with our own bank, which we were able to introduce into two of the advertisements. 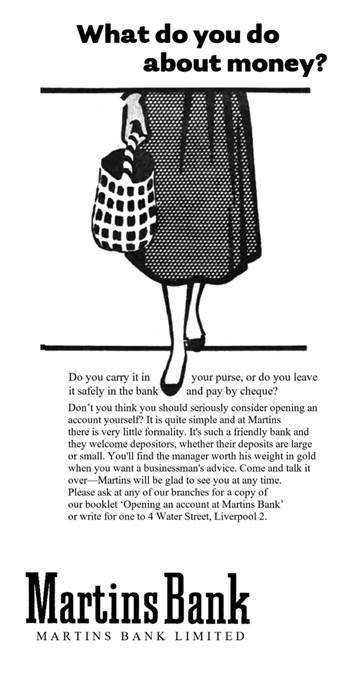 Now for just the tiniest amount of dumbing down: Apologies for not grovelling at the end of correspondence, and the promise of a warm welcome from a manager who takes an interest in what you get up to when you’re not doing your banking! 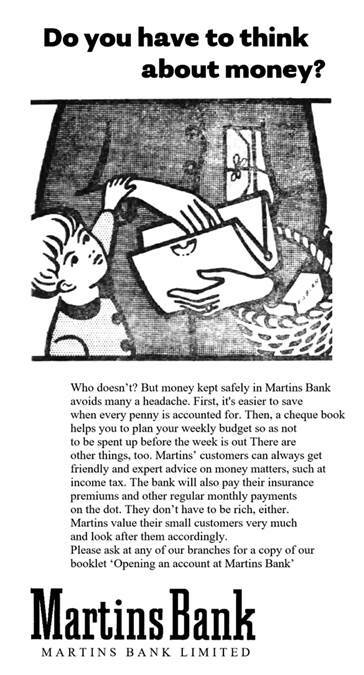 The rather staid advertising of the 1940s and 1950s is all about appealing to customers’ trust – there is no better, safer or wiser bank. 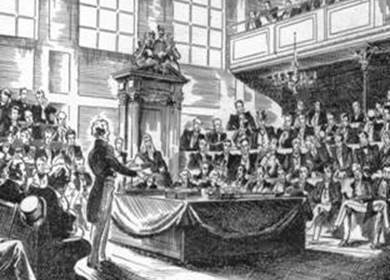 This is a world where it would seem that all businessmen both seek and give wise counsel. Your money is safe, you are safe. 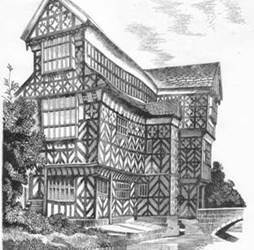 Occupations, stately homes, even that most solid and dependable of games, golf - all are used to show stability, care and trust. The advice you seek is available LOCALLY, thanks to Martins’ hierarchy of branches and local district head offices with their own board of directors and district manager. 1958 – mind your language(s)! The Royal National Eisteddfod is perhaps the most cherished and historical annual event in Wales. Martins already takes its role in the Principality very seriously, and bi-lingual staff are employed in areas where Welsh is used as a first language. 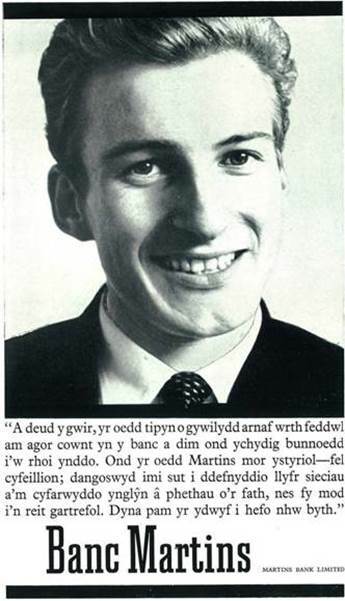 So, from 1958 Martins’ advertising in Wales includes Eisteddfod and customer recruitment ads that appeal directly to English AND Welsh speakers, and uses identical adverts to get the point across! 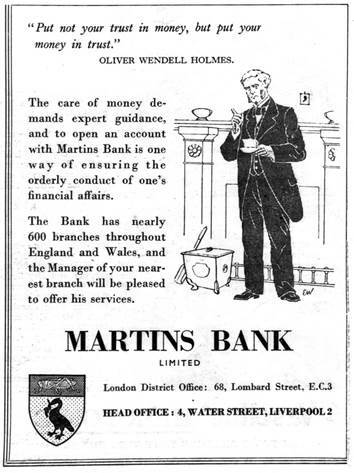 Whilst Welsh is used in advertising and posters from the mid-fifties onwards, it is not until 1966 that the Manager of Cardiff St Mary Street Branch has the bright idea of issuing bi-lingual cheques – this is another FIRST for Martins Bank. 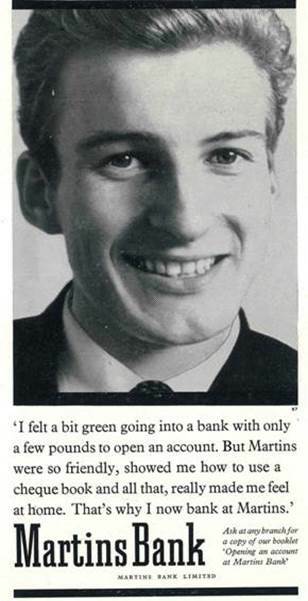 We are about to move on to the most important decade for Martins Bank’s advertising – in fact the most important decade for the Bank as a whole – the 1960s. The 1950s sees the official birth of the Teenager and sparked by the “You’ve never had it so good” generation with their pockets suddenly full of disposable income, Banks will increasingly compete for what will turn out to be an enormous consumer market.